Recentissima Asiae Delineatio : Qua Imperia, eius Regna, et Status, Unacum novissimis Russorum detectionibus circa Mare Caspium et Terram Yedso alias dict. per illor. Expedit. et Excursiones, factis sistuntur. A rare and attractive 18th century map of Asia by German map publisher Johann Christoph Homann. Covers the entire continent of Asia as well as parts of Europe and northeastern Africa. This is essentially a revised and updated version of J. 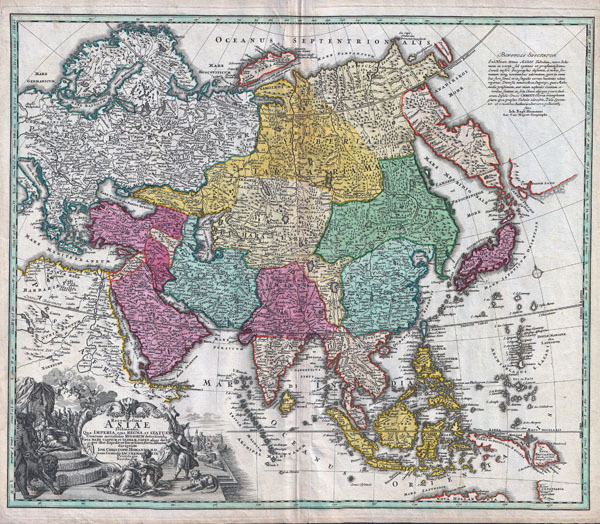 B. Homann's 1712 map of Asia. Features some interesting and important updates. Most notably, we see the addition of the Kamchatka Peninsula in the upper right hand quadrant. The lower part of the peninsula is labeled 'Kurilorum Regio,' no doubt an early reference to the Kuril Islands. While Hokkaido is not present, Japan itself is separated from the mainland by a small archipelago. Just east of these islands we see the Canal de Piecko, and beyond that a large and curious land mass labeled Compagnie Land. Compagnie Land is a mythical landmass that can be traced the work of an unknown Spanish pilot who supposedly traveled from China to New Span and published his finding along with the works of Thevenot. Present in both the 1712 map and this one, Compagnie's Land could possibly be an early representation of Alaska or a misrepresentation of Hokkaido. Korea or Corea is present if misshapen in roughly the correct location. Further south New Guinea, New Britannia, Australia (New Holland), Hoch Land, and Carpentaria (part of Australia), are personated in tentative form with largely unexplored boundaries. At the center of the map the Caspian Sea is displayed according to the 1722 surveys of Karl van Verden. Bottom left quadrant features a decorative title cartouche displaying an enthroned king in Middle Eastern or Indian garb, exotic animals including a lion and leopard, trade goods, Camels, and bowing supplicants. A spectacular and important 18th century map of Asia. Yeo, Julie, Mapping the Continent of Asia, #123.